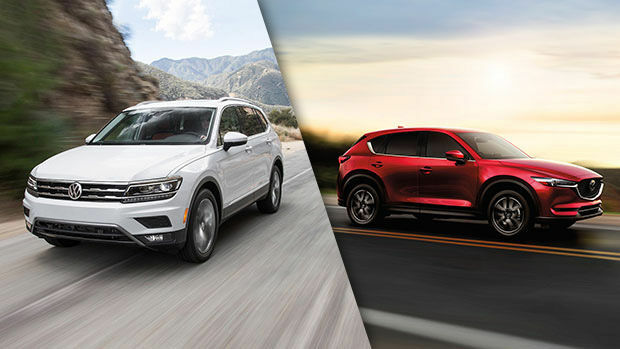 See all the highlights of the 2018 Mazda CX-5 over the 2018 Volkswagen Tiguan by visiting your Spinelli Mazda dealership right now! Are you shopping for a 2018 Volkswagen Tiguan in Lachine? First try out the brand-new 2018 Mazda CX-5 at Spinelli, your Mazda dealership in the West Island! A recipient of the Automotive Journalists Association of Canada (AJAC) Award for Best Small Utility vehicle 2018 in Canada, the CX-5 stands out from the competition for its dynamic style, its high energy efficiency as well as its high level of equipment and amenities. Do not wait any longer and come see it at Spinelli! With its dazzling Kodo design, the 2018 CX-5 at Spinelli Mazdas, it stands out for its bold and sophisticated look. It is driven, either by a SKYACTIV-G 4-cylinder, 2.0-litre DOHC engine paired with a manual gearbox that develops 156 horsepower, or a SKIACTIV-G 2.5-litre DOHC 16-valve engine, combined with an automatic SKYACTIV-Drive gear box that produces 186 horsepower. The CX-5 2018 consumes only 9.7 L/100 km in the city and 7.8 L/100 km on the highway, which is lower fuel consumption than its rival, who has a rating of 10.6 L/100 km in the city and 8.7 L/100 km on the road. The Mazda CX-5 that you can try at Spinelli Mazda in Lachine, benefits from SKYACTIV’s dynamic vehicle control technology, which also won the AJAC’s Best New Technology Innovation Award in 2017. This technology promotes smoother driving by adjusting engine torque to optimize vehicle weight displacement. Consequently, the steering is more precise and the noise, the vibrations and the jolts are clearly diminished. The standard driver assistance equipment on the 2018 Mazda CX-5 includes the reversing camera, Dynamic Stability Control, Slope Start Assist, a Blind Spot Monitoring System, rear cross- traffic alert and city brake assist, in addition to various other safety features. If the 2018 Tiguan offers only a 4-year/80,000-km and a 5-year/100,000-km basic warranty on its powertrain, the 2018 CX-5, like all new 2018 Mazda vehicles, now offers unlimited mileage on the following warranties: 3-year basic warranty, 5-year power train warranty, 5-year/unlimited mileage and 7-year anti-puncture protection warranty. Located in Lachine, Spinelli Mazda offers all Mazda car rental and leasing individuals or companies the benefits of Mazda financing plans. Of course, all Spinelli Mazda customers also benefit from current Mazda promotions. Come and meet us as of today at Spinelli.